TSG's Patient Kiosk solutions is a customer-centric differentiator that will not only empower your patients, but also improve your overall cash-flow. Patients play a critical key role in healthcare organizations, both as consumers and as participants. Thus, it is essential that every healthcare organization has a patient engagement strategy in order to meet Promoting Interoperability (PI) requirements. Click to see our patient engagement strategy. Patient engagement must be driven by a set of integrated and well thought-out technologies to ensure success within the scope of healthcare IT. TSG’s Patient Portal enables patients to communicate, view, and transmit their information, whereas the Patient Kiosk empowers patients and staff and reduces patient wait times. 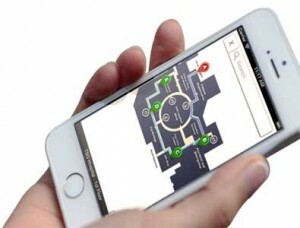 ezWayFinder is an Interactive Wayfinding application built on a mobile platform that can be accessed from a stationary kiosk, smart phone, or a tablet. It helps to ease visitors’ stress and frustration, making their experience more pleasant. An iPad based self-service kiosk that empowers patients and staff, the Patient Kiosk speeds up your intake process and allows patients to get engaged early in the healthcare process.